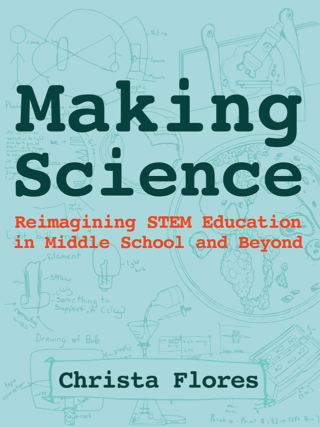 Excerpted from Making Science: Reimagining STEM Education in Middle School and Beyond by Christa Flores, published in 2016 by Constructing Modern Knowledge Press. Design is an artistic endeavor that values the creative and human centered application of math, science and technology. Using design to help others learn science is not intuitive, however, once practiced you will see how humanistic and authentic it is to incorporate design in any subject. Below is a list of the most promising benefits that I have noticed in the past six years for using design as a framework and making as the engine to empower students as they gain and apply their scientific literacy. Benefit No. 1: Students learn more, love science more, and are more engaged in science content and the scientific process when designing solutions to real problems. The creation of the artificial, whether a sling shot, calorimeter or electrical circuit, becomes a solution-finding crusade armed with scientific knowledge. When students invent, they take ownership over an idea, then face real-world problems en route to making their idea come to life. They act, think and work as real scientists and inventors. Studies show that the best predictor of STEM career choice in adulthood is linked to whether kids self-report seeing themselves as scientists when they grow up by 8th grade (Maltese & Tai, 2011). We have to trust that allowing our students to tinker, question and invent, as early as elementary and middle school, will help them to develop positive identities that encourage a lifelong love of science, math and the creative process. Making learning “hard fun” (Papert, 2002) is a real-world balancing act that happens everyday when children are designing and inventing in the classroom. Benefit No. 2: If creative confidence, collaboration, self-reliance, resilience and communication are key to being a scientist, then teaching design and engineering in science class is more effective than content-centered or teacher-directed methods. Solving real problems provides students with opportunities to identify with problems that matter, diagnose, defend an argument with evidence, give and receive feedback, utilize and critique internet resources, compose professional emails to mentors and more. Well-designed open-ended challenges versus rigidly planned lessons allow children to do real work in a controlled environment with the help of a learning community. Ownership is given to the learner, while the teacher serves as facilitator. The design aspect turns agency over to students and they become active creators, rather than passive consumers who simply follow directions. Assessment is real time and authentic. Benefit No. 3: In an age where school is becoming less relevant to students, invention and design are an engaging way to learn. Today, science literacy has become available to more kinds of learners. Educational YouTubers, science storytelling shows like WNYC’s Radiolab, and television shows such as the Mythbusters illustrate the beauty and coolness of science where some traditional science classes fail. These informal educational outlets do a good job spreading science literacy to the general public in a joyful and engaging manner. Some even go so far as to reinforce what we teach in science class — that science is both fun and methodical. Adam Savage of Mythbusters is famous for saying that it’s just screwing around if you don’t write it down. Just like interacting with a well-designed museum exhibit, or setting stuff on fire in your backyard, school should be exploratory and joyful (but safe). Joy and laughter should be welcome in any classroom. Joy relieves stress and allows for healthy goal-setting in a classroom infused with potential dead ends and frustration (Bennett, et.al., 2003; Cornett 1986). Inventing is hands on, minds on, hearts on. Benefit No. 4: Science is shareable, so is making an artifact. Allowing design and making in science classes results in students having conversations about their shared work and reinforces the importance of documenting the testing process because you don’t want to make the same mistake twice. Communication with peers and mentors is critical to getting over obstacles and improving designs. This mirrors real-world science, where communication is critical to getting support for your ideas. At the Alan Alda Center for Communicating Science at Stony Brook University this idea is part of their mission, “The ability to communicate directly and vividly can enhance scientists’ career prospects, helping them secure funding, collaborate across disciplines, compete for positions, and serve as effective teachers” (Stony Brook University, 2015). Once artifacts are created, most students are happy to share their work with others in public showcases where their process story becomes a point of pride. Unlike taking tests or writing a lab report, sharing work as a form of assessment allows students to gain a sense of identity around STEM topics, as students see their hard work mirrored back at them through the eyes and questions of an eager and engaged audience. Benefit No. 5: Using design to address or engage real problems empowers students to think of themselves as having the capacity to make the world better. Thanks to research on the impact and implication of making in education, such as that done by the aptly named Agency by Design (AbD), a project housed within Harvard’s Project Zero umbrella, research on the value of making in educational settings is now being published. Early findings from the AbD group show that a valuable sense of self is developed when children are allowed to make, invent and tinker. This sense of self, or “maker empowerment,” is a person’s ability to see the opportunity in their environment both for making things and for making change in the world. AbD defines maker empowerment as “a sensitivity to the designed dimension of objects and systems, along with the inclination and capacity to shape one’s world through building, tinkering, re/designing, or hacking” (Agency by Design, 2015a). Others would just call this creativity, mindfulness or resourcefulness. No matter what you call it, we want students to experience learning that requires them to look closely at the objects they interact with, explore the complexity of those objects, make deep connections, and to dream big while they develop agency to make change in the world around them. In summary, the use of the design process in school is a creative exploration of hard, yet fun problems (rigor, risk and reward), positive identity formation (“I am creative,” “I am a scientist,” “I can solve problems”) and collaborative learning (“we are greater than me”). Add responsible resource management and exposure to social justice issues, and design becomes a tool for innovation, empowerment and stewardship. Using design and engineering in science trains brains to think flexibly, to see layers of complexity in the environment all around, to discover loopholes in assumed truths and to look for opportunity to make the world a better place. 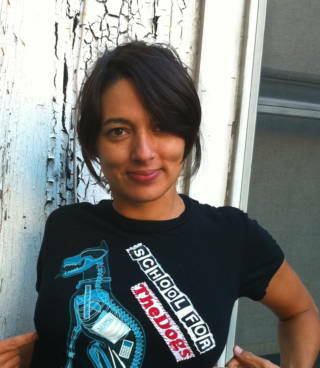 Christa Flores is an anthropologist turned science and making teacher. She develops classroom-tested lessons and resources for learning by making and design in the middle grades and beyond. Making Science offers project ideas, connections to the new Next Generation Science Standards, assessment strategies, examples of student work and practical tips for educators.